from 5.30- 8.00pm. A map is here. 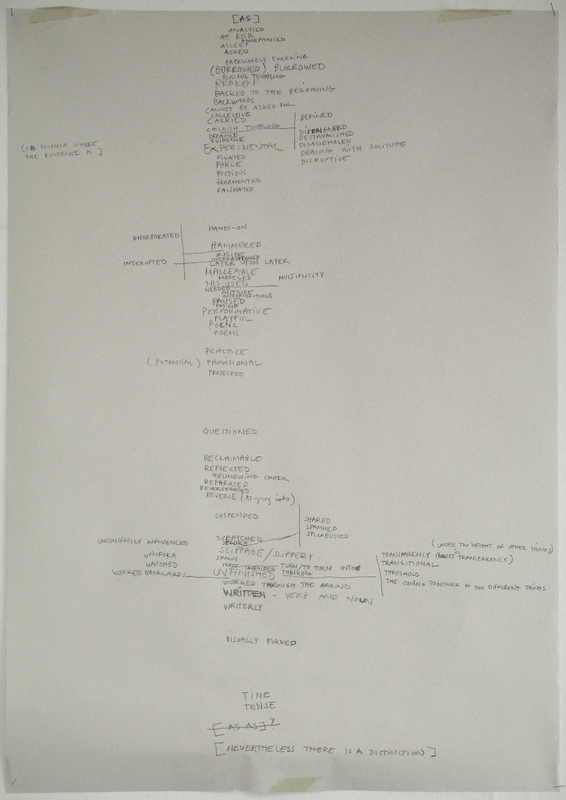 The Story so far: During our event at the Five Years Gallery, Marianne Holm Hansen created a lexicon of art writing (see images above) out of performances/ lectures/ screenings by David Berridge, Tamarin Norwood, COMPULSIVE HOLDING (Hyun Jin Cho and David Johnson) and Matthew MacKisack. For our discussion on the 7th we will return to these lists, to see what can be proposed and unfolded from them. The lexicons are part of Marianne’s For The Record (A written conversation) project. The evening on the 7th will be an informal series of readings, interventions, performances, that use these images and their vocabulary as the starting point for a conversation. Proposals for presentations are invited. These may as simple as selecting a particular word for our consideration, replacing a word, suggesting ways of grouping words, and/or offering a short commentary. Or they may be as complicated as no-budget, a studio space, and up to 15 minutes allows. Throughout the evening we will compile the final pamphlet in the first ART WRITING FIELD STATION chapbook project. Please email verysmallkitchen@gmail.com if you would like to attend and/or present. Please note that it is not necessary to have attended the original Five Years event as we will be working solely from Marianne’s lexicon. Please bring a bottle. The night will also feature the grand(-ish) launch of the ART WRITING FIELD STATION ARCHITECTURAL OPPORTUNITY COMPETITION. ALSO COMING SOON: ART WRITING FIELD STATION goes to Leeds, MAR 27th 2010, 10.30 -1.30pm (in collaboration with OPEN DIALOGUES & Writing Encounters). More details to follow. GUESS WORK GUEST WORK was an exhibition at 7.9 Cubic Metres at the Stanley Picker Galley, Kingston Upon Thames (Nov 4-28 2009). It was developed from a script by myself, and included the curation of project by Compulsive Holding (Hyun Jin Cho and David Johnson). 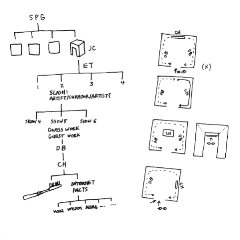 The illustration above is a plan of the exhibition, drawn by Jin. 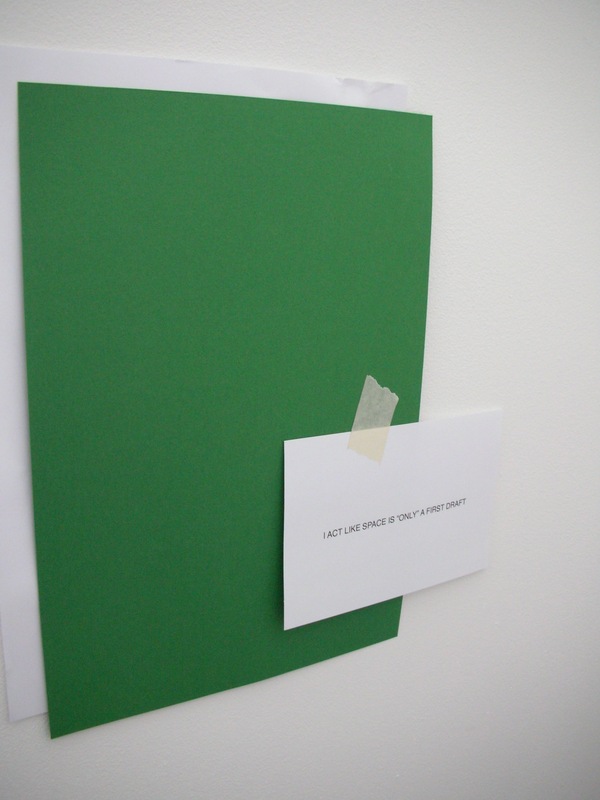 DAVID BERRIDGE: Guess Work Guest Work began with a script for an exhibition. 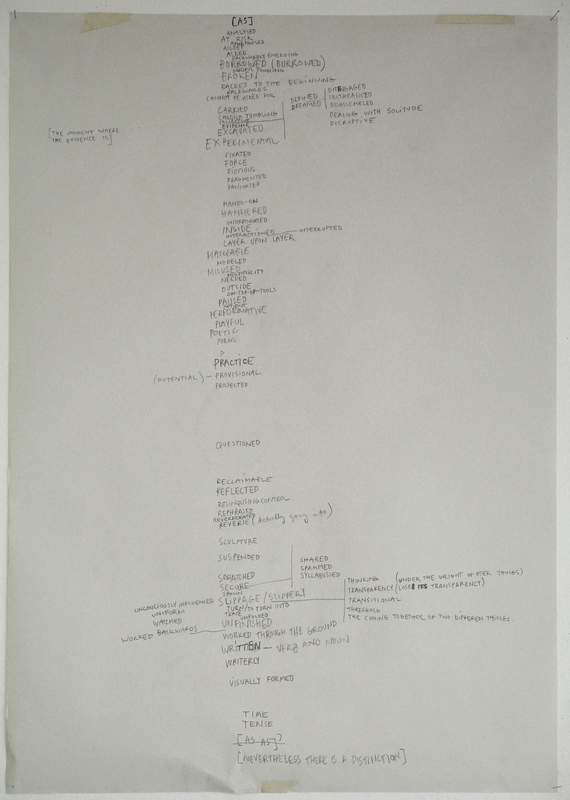 This unfolded over several months as a sequence of notes, mini-essays, quotes, typographic scrawls, concrete poems and other hybrid text forms. As the manuscript took shape, these were often re-written and re-edited. I wanted to make a text that worked if encountered on the page, but one also intended to become an exhibition in 7.9 Cubic Metres. The starting point for many of these texts was an interest in two recently published texts on curatorial history: the interviews of Hans Ulrich Obrist’s A Brief History of Curating and the photos, floor plans and archival documents of Harald Szeemann: Individual Methodology. Both books sought to give concrete form and presence to the exhibitions of a formative generation of curators whose work would otherwise disappear. Whilst invaluable, I was struck by how often attempts to describe an exhibition ended not in a clear blueprint of the show but in a series of suggestive phrases, poetic images, and self-invented jargon. This either arose causally and spontaneously in conversation or was an example from an oft repeated personal working lexicon. Rather than lament this condition, I decided it was how legacy becomes manifest and the work of such curators became available to contemporary practice. The title Guess Work Guest Work, for example, derived from my own misreading of Harald Szeemann’s Institute of Spiritual Guest Work – guest worker [gastarbeiter] being the German term for migrant workers. I wondered what would happen if I stayed within this space of mis-reading, using it as a form of engagement both with curatorial history and my own practice. One consequence was a need to open the exhibition and the script to the artists’ COMPULSIVE HOLDING, whose own toothbrush project I intuitively felt to be a closely related exploration. If an exhibition has a script then there is also likely to be a performance. My original intention was to install the script as a series of A4 sheets. Instead, over the three days available for setting up, I created the installation documented below. 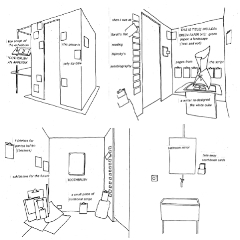 The script was available for visitors to read, but in the cube itself it was taken down, covered up, replaced by new text, and/or transformed into objects. If there was a surprise within the process of making Guess Work Guest Work then it was the degree and nature of change involved in the shift from page to space. I continued adding, changing, and deleting until a few minutes before the open view began. The script of Guess Work Guest Work was itself re-written during the process of installation so that it could function as an invitation to other practitioners, not solely a document of my own process. This meant the project by Compulsive Holding and my own project in relation to the curator Pontus Hultén were removed, as future enactments of the script will be likely to make their own connections. On the show’s final weekend, the installation was taken down and the space hosted WRITING EXHIBITIONS, a two day seminar and a curated series of micro-exhibitions exploring connections of writing and exhibition making.